The new state-of-the-art lobby at Courtyard Boston Raynham provides greater flexibility and choices for our guests, featuring inviting, flexible spaces to work or relax in, free high-speed Wi-Fi throughout the entire hotel & easy access to the latest news, weather and airport conditions via our GoBoard . The highlight of our new lobby experience is The Bistro, which provides guests with healthy food and beverage offerings in the morning and evening dinner service with cocktails. We offer a fitness & cardio center, indoor pool & whirlpool, 24-hour business center & a quick print station to get you on the go faster. 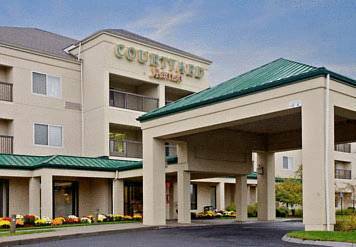 Conveniently located along Routes 44 & 24, the Courtyard Boston Raynham is just minutes from the DePuy Synthes Institute at Johnson & Johnson, Nestle Waters, Electrochem, Ocean Spray, General Dynamics, Idex, Travelers, Mega North American, Serta, and Ametek/Brookfield Engineering. We are just 8 miles from Bridgewater State College and 14 miles from Stonehill College. Spend the night in the same house where Lizzie's parents were mysteriously murdered. Or take a tour in the daytime, if you're scared. Had this famous chicken been born only a few hundred feet east, it would have been the Massachusetts Red.